Many arguments are heard about ISON. 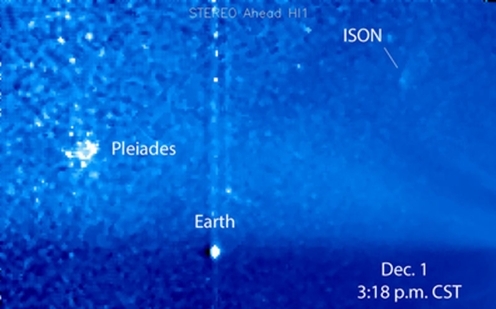 From our point of view, ISON is turning around the Sun watching the Sun itself and the planet earth. ISON is a mothership far beyond any recognition of the earthly scientists and traverses the space with making them greatly astonish. Since this mothership ISON is basically a vehicle of light and its shape and colors are changeable at will, scientists are unable to follow its movements. As is well acknowledged, many spaceships are hovering above the ground and they are visible for those with third eyes opened. It is transfiguration of human DNA, shift of Gaia, clearing up of environment of Gaia including cleansing of air and water that these spaceships are carrying out to assist humans and cooperate with them. However, we will use various means like feint operations and enchanting operations (lol). This is the limit that we can inform you now. Although, from your point of view, our activities might have been a little too slow and required much perseverance, the process for ascension is proceeding surely and perfectly. From now on, further astonishing events will happen, but these are the ones that we preform carefully and boldly taking much care of your spiritual growth as a whole. This is based on the heavenly intention.? @Rest assured with delight that everything will carried out at perfect timings and we are proceeding at very high speed. since long, and we would dare to mention that the astonishing big event would take place “within this year”. It is the most peaceful when you are along heavenly intention and in its bosom. Please convey my best regards to your friends saying that I am one of the close souls to Sananda. "Greetings, Beloved Family! 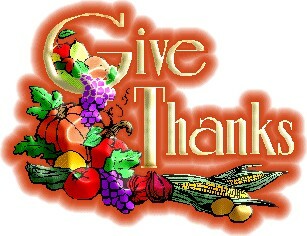 This is indeed a time for giving thanks, for we have accomplished much and you have traveled far upon your paths! And, we are most Joy-full to report to you that, as you rise more and more in your vibrations, we are that much more empowered to remove the few remaining obstacles in the way of your complete and permanent entry into the Golden Age - and those beyond!!! "For in Truth, the Golden Age is but a transitory moment in the full spectrum of your history/herstory, but it is a most significant one upon your timelines. This is so because of its status as the turning point for you. It brings to you all that you have striven for in your desires for Peace on Earth, with Freedom and Abundance for all! "Indeed you have reached the point of no turning back, and we are working with you to swiftly bring forth all that you have promised and committed to for yourselves, and for the whole of Planet Earth! It is for you to be in the en-Joyment of the Golden Age, sure in the knowledge that it is yours to claim. And, it is for us to be your constant traveling companions upon your paths, thus ensuring that you will be rapidly moving forward - and upward!!! "We shall be in Joyous discussion and further empowerment of this on Tuesday next when we gather. * We shall be honored to hear the latest behind the scenes report from our A&A Team,** and to participate in a most high vibrational Crystal Exercise with Sekhmet. And, Sananda shall be joining us with a special blessing for this season of Holy Days! We shall indeed be joining together in Gratitude for the loving Oneness we share, and for the path we travel together!!! Salut!" The greatest crisis facing our country today is the obscene level of wealth and income economic inequality we now see. This is a moral issue, an economic issue, and a political issue. While the very rich get richer, the middle class continues to disappear and we now have more people living in poverty than ever before. Despite huge increases in technology and productivity, tens of millions of workers are finding it harder to feed their families, pay for health care, send their kids to college or put aside savings for retirement. While large corporations are earning record-breaking profits, real unemployment is close to 14%, and youth unemployment is at 20%. An entire generation of young people is struggling to find a place in the economy and repay their college loans. In recent years, with 95% of all new income going to the top 1%, we have seen a huge increase in the number of millionaires and billionaires. One family, the Walton family of WalMart, now owns more wealth than the bottom 40% of Americans. Meanwhile, we continue to have, by far, the highest rate of childhood poverty in the industrialized world. While the average American is increasingly alienated from the political process, billionaire families like the Koch brothers are spending hundreds of millions of dollars to elect candidates who support their extreme right-wing views. During the last week a new and important ally has arisen in the struggle against unfettered capitalism and wealth and income inequality. In his recently published Exhortation, Pope Francis warns the world against the idolatry of money and the false promise of trickle-down economics. Clearly, not everyone shares Francis’ religion, and many of us have deep differences with a number of positions taken by the Catholic Church. Nonetheless, we can all, I think, share his commitment to economic justice and learn from his wise assessment of how modern civilization, in its relentless pursuit of profit and its dependence on “the market” to make final valuations of what is good, has lost touch with the ethical imperatives that should guide our society. I appeal to other religious leaders to focus on matters of economic justice and to speak out from the context of their own respective traditions. Just as the commandment “Thou shalt not kill” sets a clear limit in order to safeguard the value of human life, today we also have to say “thou shalt not” to an economy of exclusion and inequality. Such an economy kills. How can it be that it is not a news item when an elderly home­less person dies of exposure, but it is news when the stock market loses two points? This is a case of exclusion. Can we continue to stand by when food is thrown away while people are starving? This is a case of inequality. Today everything comes under the laws of competition and the sur­vival of the fittest, where the powerful feed upon the powerless. As a consequence, masses of peo­ple find themselves excluded and marginalized: without work, without possibilities, without any means of escape. Human beings are themselves considered consumer goods to be used and then discarded. We have created a “throw away” culture which is now spreading. It is no longer simply about exploitation and oppression, but something new. Exclusion ultimately has to do with what it means to be a part of the society in which we live; those excluded are no longer society’s underside or its fringes or its disenfranchised – they are no longer even a part of it. The excluded are not the “ex­ploited” but the outcast, the “leftovers”. In this context, some people continue to defend trickle-down theories which assume that economic growth, encouraged by a free market, will inevitably succeed in bringing about great­er justice and inclusiveness in the world. This opinion, which has never been confirmed by the facts, expresses a crude and naïve trust in the goodness of those wielding economic power and in the sacralized workings of the prevailing economic system. Meanwhile, the excluded are still waiting. To sustain a lifestyle which excludes others, or to sustain enthusiasm for that selfish ideal, a globalization of indifference has devel­oped. Almost without being aware of it, we end up being incapable of feeling compassion at the outcry of the poor, weeping for other people’s pain, and feeling a need to help them, as though all this were someone else’s responsibility and not our own. The culture of prosperity deadens us; we are thrilled if the market offers us some­thing new to purchase. In the meantime all those lives stunted for lack of opportunity seem a mere spectacle; they fail to move us. One cause of this situation is found in our relationship with money, since we calmly accept its dominion over ourselves and our societies. The current financial crisis can make us overlook the fact that it originated in a profound human crisis: the denial of the primacy of the human person! We have created new idols. The worship of the ancient golden calf (cf. Ex 32:1-35) has returned in a new and ruthless guise in the idol­atry of money and the dictatorship of an imper­sonal economy lacking a truly human purpose. The worldwide crisis affecting finance and the economy lays bare their imbalances and, above all, their lack of real concern for human beings; man is reduced to one of his needs alone: con­sumption. While the earnings of a minority are grow­ing exponentially, so too is the gap separating the majority from the prosperity enjoyed by those happy few. This imbalance is the result of ide­ologies which defend the absolute autonomy of the marketplace and financial speculation. Con­sequently, they reject the right of states, charged with vigilance for the common good, to exercise any form of control. A new tyranny is thus born, invisible and often virtual, which unilaterally and relentlessly imposes its own laws and rules. Debt and the accumulation of interest also make it difficult for countries to realize the potential of their own economies and keep citizens from en­joying their real purchasing power. To all this we can add widespread corruption and self-serving tax evasion, which have taken on worldwide di­mensions. The thirst for power and possessions knows no limits. In this system, which tends to devour everything which stands in the way of in­creased profits, whatever is fragile, like the envi­ronment, is defenseless before the interests of a deified market, which become the only rule. Must learn that their parents aren't perfect..
We had to eat sandwiches. You'd think we were convicts in a prison. Empty the trash and all sorts of cruel jobs. We had to wait until we were 16. It just doesn't have enough mean moms! So, what are some common brands who use it? Nanotitanium is found in products produced by Jello, Nestlé, M&M's, Mother's, Mentos, Albertson's, Hostess and Kool Aid. 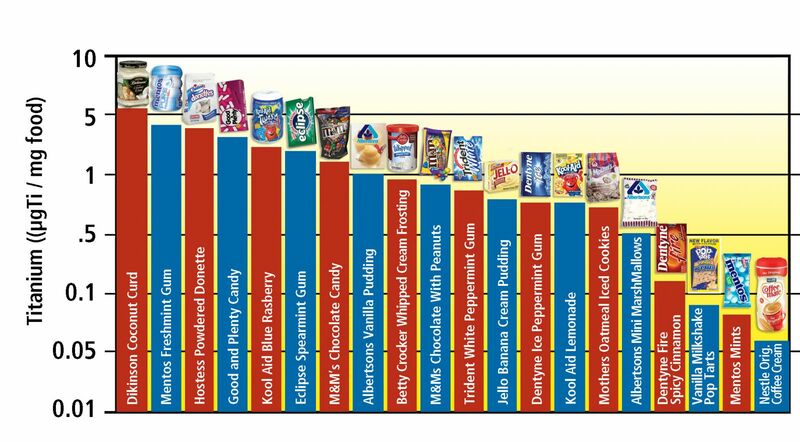 Below is a table from the 2012 E Magazine article "Eating Nano" revealing its presence in common U.S. packaged goods. Much like present day radiobiological risk assessments for technologies like mammography were developed long before the discovery of DNA, making it impossible to comprehend their DNA-damaging properties at that time, present day biosafety regulations of TiO2 were determined long before the advent of nanotechnology. In both cases, the true harms of these technologies were -- and still are -- greatly underestimated. As a result of this information gap, TiO2 is currently classified as 'generally recognized as safe' (GRAS) by the FDA, regardless of format. Remarkably, the FDA still allows titanium dioxide in sunscreens "at concentrations of up to 25 percent alone and 2 to 25 percent in combination with any proposed Category I sunscreen active ingredient" without considering the toxicity differential of particle size.Considering that concentrations as low as 0.001% by weight have been found to exhibit clear cytotoxicity within exposed cells, the biosafety regulations governing TiO2 are as great as 5 orders of magnitude or higher less stringent than they should be to protect the consumer. Nanoparticles are so small they are below the threshold of visibility. This is one reason why they are used for sun protection factor, as 100 nanometers or smaller particles will not leave the white pasty appearance on the skin associated with larger particles. 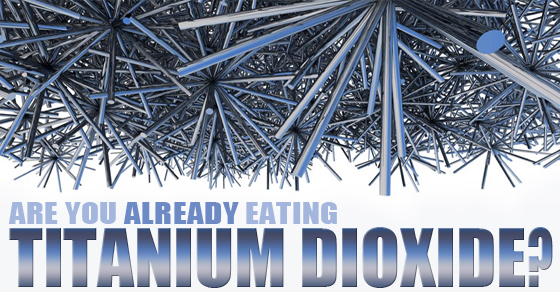 What you can't see, however, is still there – and in the case of nanotitanium, may slip through the surface layers of our skin into more sensitive tissues, as well as our blood stream. This is also why, if you use sunscreen, you should make sure the ingredients say "non-nanoparticle" when describing titanium dioxide or zinc oxide. And this rule applies to purportedly 'natural' brands as well. Technically, a nanoparticle, also known as a 'ultrafine particle,' is a particle that is sized within the nanometer scale: literally, anywhere between 1-100 billionth (nano) of a meter in diameter. Going up in scale, larger particles are known as 'fine particles,' sized between 2,500 and 100 nanometers, and so-called 'coarse particles' are sized between 10,000 and 2,500 nanometers. Nanotechnology inverts the unsophisticated logic of conventional toxicology risk assessments: namely, that the smaller the amount of something (concentration or size), the less harmful it is. We have seen how this logic has failed with petrochemical-derived chemicals like benzene, considered toxic in the parts-per-trillion range, and endocrine disrupters like bisphenol A and parabens, which exert powerful hormone-mimicking properties that sometimes increase as their concentration decrease. More recently, Monsanto's Roundup herbicide (glyphosate), was found to exhibit estrogenicity (and concomitant carcinogenicity) in the parts-per-trillion concentration range. There is also the case of so-called 'low dose' radioisotopes such as depleted uranium, whose relatively low radiolytic decay relative to gamma-ray emitting plutonium generates the illusion that it is safer (recent research performed by the U.S. Army's own Radiobiological Research Institute indicates these "lower risk" radiation sources cause up to a million-fold more damage than present risk models explain due to a phenomenon known as the photoelectic effect). So, why isn't more being done to protect the consumer from the clear and present health threat represented by nanotechnology? Considering that the Food and Drug Administration does exactly that: administers and/or executes the interests of the food and drug manufacturers, we are supplicating to the wrong entity. The FDA is at least consistent by deciding to allow the food industry to govern itself, but what about the food industry's liability in saturating our food supply with trillions of nanoparticles per serving, without warning the consumer? According to Tom Philpot, writing for Grist in 2010, "As with GMOs, the strategy seems to be: release into the food supply en masse first; assess risks later (if ever)." Moreover, as a growing body of peer-reviewed research on the dangers of nanoparticles accumulates, the millions who have already been exposed unknowingly to their ill effects have a legal right to sue for damages. The food industry's increasingly nefarious stance towards the very consumers who ensure their continued business defies logic, and indicates just how unethical their business model really is. There is really only one answer to this problem. As with unlabeled GMOs, the consumer must refuse to consume them, forcing the manufacturers to bow to the holy dollar and reformulate; or, better yet, the 'consumer' must learn how to redefine itself entirely by becoming, once again, a producer, one garden (urban, suburban or rural) at a time. By growing and eating whole foods directly from the earth, we eliminate a wide range of health hazards the mass market food industry has built into their disease-promoting business model. Graduate student Zhong Zhang applies silver nanoparticles to an apple. Photos by Kyle Spradley. Credit: University of Missouri. Nanomaterials are increasingly used in water treatment, food packaging, pesticides, cosmetics and other areas. There is a growing concern that these particles could pose a potential health risk to humans and the environment. In a new study, researchers at the University of Missouri have developed a reliable method for detecting silver nanoparticles in foods. The growing trend to use other types of nanoparticles has revolutionised the food industry by enhancing flavours, improving supplement delivery, keeping food fresh longer and brightening the colours of food. 7 COMET ISON - IS NOT A COMET. COMET ISON - IS NOT A COMET. Comet ISON is not a Comet rather A MotherShip circumventing the Earth Unfolding the Event a Message from Lord Sananda through Elizabeth Trutwin. StarShip ISON uses this magnetic liquid light energy, Etheric energy of Helios and Vesta for the triple alignment between the Giza Plateau, the Sedonian plateau on Mars, and the three stars in the Belt of Orion [El – An – Ra ]. The energies of Saturn, Uranus and Venus correlate with the alignments on Giza, Sedona, Mars and the Belt of Orion. StarShip ISON moves Earth and Mars back to their alignments before the Orion War when the Earth wobble was created in the Flood when the Waters of the Surface of Mars were thrust onto Earth. The pyramidal grid areas of the pyramids on Mars are 10x bigger than the pyramidal grid areas at Giza and 5x bigger than the pyramidal grid areas in China's pyramid area. This action will heal the karma between Mars and Earth as well as the Planet Marduk and the Asteroid Belt. This heals the War between the Gods and the Hybrid Children of the daughters of Man and Gods. We finally, ecstatically and orgasmically RETURN TO LOVE AS ONE. The 12 Rays of Cosmic Light and the 12 strands of DNA are returned to Wholeness. This was accomplished by the Kumaras agreeing to incarnate into each one of the 12 Tribes. In this way our DNA has been returned to Oneness. StarShip ISON circling the Sun prepares Earth to come sweetly into Zero Point by the end of 2013. The elements of Earth, Water, Fire and Air merging with Liquid Light - the Ether and finally Higher Consciousness which is the 6th element end all suffering on Earth. We reestablish Heaven on Earth. As above, so below. Rejoice! The Goddess returns. This happened before when First Cause was born in the Hindu story of the Peaceful Deities and the Wrathful Deities churning the Milky Way Galaxy during a passage through Ophiuchus at Galactic Center. These are the Elohi Angels who never fell and the Elohim Fallen Angels. They simply forgot how much they were loved. Wars were waged. We return to Wholeness. Together as One in Unity Consciousness. Watch to see chaos rein before all is complete with changeover. The dark cabal cut their DNA strands and now that this healing is taking place they are finding those connections are impossible to repair. When they cut their 11th Strand of DNA it is connected with Emotions. The 12th Strand of DNA is connected to LOVE. Some within the dragon families will find that they cannot access these healings and they will become rebellious as the end nears. You will continue to see acting out. This may be in the form of false flags, shootings, weather manipulation or worse. Blaze the Violet Flame as we enter this challenging time through middle December. It is very important at this time to become absolutely detached from all things in your life. If you resist, pain and suffering will follow. Decidedly. Know that the flux period is in Divine Order and this is the only way to carry out the changes for Billions of Souls. Be Peace Within. Forgive yourself swiftly if you make a mistake. Forget it. Keep walking. Lean into the wind. StarShip ISON is working together with the wormhole created by the Archangels between Jupiter and Earth creating unprecedented swift changes in the Cosmos. We are almost there! Call on Me for Guidance. I am always beside you. You are never alone. Namaste! This is Lord Sananda through Elizabeth Trutwin, November 26, 2013. © All Rights Reserved. http://ElizabethTrutwin.org An Invitation: Many have benefited from this and I would like to continue to offer it. For a one hour booking you may email me at eltrutwin@gmail.com It is amazing what comes through from Lord Sananda, the Higher Self of Jesus. This is a question and answer session on video Skype or telephone and you may ask anything you like. I have several written testimonials. Sananda’s Invitation through Elizabeth Trutwin: Many here are looking for answers about their personal life, Mission and what direction to take at this time. I have information I would like to share with certain individuals. As you read this you will know if it is for you. I have asked Beth to offer her Service for 1 hour telephone consultations where she will channel me, Sananda to you over the phone to answer your questions. You have worked very hard and it is time we sat down together to discuss your next steps. I thank you for your enduring service to the light. ~Lord Sananda For more information please visit http://ElizabethTrutwin.org/SanandaKumara Please look for my new website launch coming soon! "Pretty much anything you could do to increase the revenue of your organization appeared legitimate," says Martin Taylor, chief executive officer of London-based Barclays Plc from 1994 to 1998. "Here was the market doing something blatantly dishonest. I never imagined that people in the financial markets were saints, but you expect some moral standards." That's not all! On December 10th the US Regulatory Agencies are expected to pass the Volcker Rule which takes the Banksters OUT of the market rigging game permanently! "With U.S. regulators scheduled to vote Dec. 10, the largest firms are getting little detail about the final terms of the Volcker rule's ban on proprietary trades, and still have basic questions about what kind of market-making will be allowed, said three senior U.S. bankers. They're also wondering whether they'll have to change practices or curtail business in some less-liquid markets, the bankers said." But the REAL story is not the banks loss of revenue...IT IS THE END OF MANIPULATION! An unbacked fiat monetary system CANNOT survive without the constant and continual computer rigging of markets. Right now, as we speak, the rigging operation for silver is being transferred to BlackRock and other hedge funds...but can they maintain the game for much longer without the unlimited cash from the Central Bank directly? Everything is coming into line on the Road to Roota and you should be sitting on the sidelines, out of their system, with your stacks of physical silver (and a nice supply of Bitcoin) for when the banking system fails. *NOTE: US Silver Eagle sales have now officially surpassed all historical sales records...EVER! In 2013 the US Mint has sold 41,824,500 ounces and that is WITH massive rationing throughout the year on the orders of US Treasury Secretary, Jack Lew. Wanna bet that that the huge jump in Silver Eagle sales is due to the new Bitcoin millionaires? There is nothing more bullish for silver than a rising Bitcoin price! More Bitcoin-to-Silver sales to come in 2014 as Bitcoin surpasses $10,000 per coin on it's way to $1M per coin when the banks collapse! For Xmas this year EVERYBODY on my list gets physical Silver and Bitcoin! PS - The Road to Roota Letter FREE archives are fun to read through as it takes you from where we were 10 years ago in our battles to where we are today. Winter is the season of flu and cold, so no wonder you have uncomfortably burning and itchy throat. Instead of taking antibiotics and pills, prepare this efficient homemade remedy and heal your sore throat faster that you think. In a clean 12 oz mason jar (2 cup size) put thinly sliced lemons and ginger and add honey. Stir well. Close the jar and place it in a fridge where the ingredients will turn into jelly. Put a spoonful of the jelly in a glass and add hot water. Drink this tea whenever you wish and need it. This homemade remedy can be used for three months, which is an excellent advantage. It is recommended for both children and old people mostly because it contains no artificial or harmful ingredients. Customer: Thanks, I ordered a "Spring Bouquet" for our anniversary, and wanted it delivered to my wife. Receptionist: Interrupting, Sir, "Spring Bouquets" do not meet our minimum standards, I will be happy to provide you with Red Roses. Customer: But I have always ordered "Spring Bouquets", done it for years, my wife likes them. Receptionist: I need that to determine your government flower subsidy, then I can determine how much your out-of-pocket cost will be. But if your income is below our minimums for a subsidy, then I can refer you to our Flower Aid department. Customer: Whoa! I don't remember seeing anything in the Constitution regarding flowers as a right. Receptionist: It is not really a “Right in the Constitution,” but Obama Flowers is Constitutional because the Supreme Court Ruled it a "Tax". Taxes are Constitutional. But we feel it is a right. Receptionist: It's the law of the land sir. Now, we anticipated most people would go for the Silver Package, so what is your monthly income sir? Receptionist: That would be the IRS sir. Thanks for calling Obama Flowers. Have a nice day and God Bless America. The government's actions against WikiLeaks in 2010 and companies' reactions to that pressure, as well as the prosecution of the PayPal 14 raise critical questions about the nature of the First Amendment in the digital age. The news reports say that the test scores of American students on the latest PISA test are "stagnant," "lagging," and "flat." The myth persists that once our nation led the world on international tests, but we have fallen from that exalted position in recent years. Wrong, wrong, wrong. Since Oz is about to celebrate its 75th anniversary next year, here's a fun peek at a few details that may have escaped the attention of even the most ardent Ozophiles. Wake up, people. This needless incessant phone-to-phone contact is ruining relationships and not just romantic ones. Bottom line: Our children need a break. I was honored to be the first American President to welcome Mr. Mandela to the White House. It remains a genuine highlight from those four years I was privileged to hold that high office. A MUST NEED TO KNOW!!!!!! Nice win over the IRS who sent a Notice of Levy and then a Summons and then issued a Warrant for Linda Wall’s arrest. She beat them by showing they created false securities using laws and codes that only apply to BATF Activities, CFR 70. By sending out unsigned, unverified, unvalidated liens and summonses, they create false securities which is against the Law and involves jail time. And, to think the IRS uses constructive fraud every day to coerce and intimidate non-U.S. citizens into paying what they do not owe. Keep this in your file, it is a helpful resource for fighting Goliath. RE: United States of America ‘. Lynda Wall, CV 04-5352-DDP* (MANx) in United States District Court. Central District of California. Western Division. You are hereby put on NOTICE pursuant to Title 18 USC § 4 of the commission of crimes cognizable by a court of the United States under Title 18 USC §513 to wit: “513(a) Whoever makes, utters or possesses a counterfeited security of a State or a political subdivision thereof or of an organization, or whoever makes, utters or possesses a forged security of a State or political subdivision thereof or of an organization, with intent to deceive another person, organization, or government shall be fined not more than $250,000 or imprisoned not more than ten years, or both”. See also Sections 2311, 2314 and 2320 for additional fines and sanctions. Among the securities defined at 18 USC § 2311 is included “evidence of indebtedness” which, in a broad sense, may mean anything that is due and owing which would include a duty, obligation or right of action. 4. Order to Show Cause by Gregory E. Van Hoey, Trial Attorney and alleged Judge Dean O. Pregerson. 6. Warrant for Arrest by alleged Judge Dean D. Pregerson; Sherri R. Carter, Clerk of Court; and John Chambers, Deputy Clerk. All the above referenced documents are counterfeit securities because they do not evidence both the Internal Revenue Code statutes(s) and the enforcement regulation(s) as required by law. 5. The Regulation must enforce (put into force) the specific statute of the IRC. Since regulations may be directive (voluntary) or mandatory, the CFR Parallel Table of Authorities lists the enforcement (mandatory) federal regulation; all others are directory and may be ignored. “That body of law which codifies all federal tax laws including income, estate, stamp, gift excise, etc, taxes. Such laws comprise Title 26 United States Code, and are implemented by Treasury Regulations and Revenue Rulings.” (Emphasis added) IRC Black’s 5Th Ed. Page 732. Pursuant to Title 26 USC §7805(a), “regulations for the enforcement of this title”, and in the case of Lynda Wall, IRS has no authority of law, which would allow them to place into evidence a “Summons” Form 2039, pursuant to Tile 26 USC §7602.This procedure is onlyallowed under the excise tax law procedure where there exists a contract and registration by application for the special privilege of being allowed to operate in that special business, and therefore a summary judgment procedure is allowed. If one checks the manuals from the government printing office you will find under Title 26 CFR, “Federal Regulations” that every subject matter of tax has its own 26 IRC §6001, et seq., Sections for procedure. This cannot be mixed with any other subject tax matters of procedure because that would make law “arbitrary and capricious”. “We think it important to note that the Act’s civil and criminal penalties attached only violation of regulations promulgated by the Secretary: if the Secretary were to do nothing, the Act itself would impose no penalties on anyone. And at 830 L.ED. 2d: “... the actual implementation of the statute by the Treasury Regulation. The Government urges that since only those who violate these regulations may incur civil or criminal penalties. It is the actual regulations issued by the Secretary of Treasu1y, and not the broad authorizing language of the statute, which are to be tested against the Fourth Amendment; and that when so tested they are valid”. And further at 831; “The Internal Revenue code, for example, contains general records to be kept by both business and individual taxpayers, 26 USC §6001, which have been implemented by the .Secretary in various regulations”. NOTE. 27 CFR is for Alcohol, Tobacco, Firearms and Explosives, not income or employment taxes. It is obvious that the whole action in the case of United States of America, Petitioner, vs. Lynda Wall, Respondent is predicated upon the use of the statute in Title 26 §7602 and the Treasury Regulations §301.7602-Iand 26 FR 301.7602-1 as stated on page 2 of the Counterfeit Security Petition to Enforce Internal Revenue Service Summons. Since the Federal Register 1993 CR Index, Statute and CFR Table of Authorities shows that the only Enforcement Regulations pursuant to Title 26 USC §7401, Judicial Proceedings Authorization, §7604, Enforcement of Summons, and §7602, Examination of Books and Records is predicated on Enforcement Regulations promulgated pursuant to the power and authority of 27 FR Part 70 (Alcohol, Tobacco, Firearms and Explosives),then it is clear that unless the acts and actions of the above named federal government officials, employees, agents, and public officers are predicated upon some material facts that show that Lynda Wall is engaged in federally taxable or federally regulated activities, commodities or events pursuant to 27 CFR Part 70, the acts and actions of the above named Government agents and officials are based upon false premises and Counterfeit Securities. Lynda Wall is NOT engaged in federally regulated activities, events or commodities under 27 FR Part 70 within reason and belief. Therefore, it is reasonable to presume that Form 2039 Summons. 02/11/04; the Declaration of Shereen Hawkins, 04/13/04; the Petition to Enforce Summons, 07/14/04; the Order to Show Cause, (not dated, not signed by the alleged Judge, no court seal); Order of Civil Contempt, 05/02/05; and Warrant for Arrest (civil contempt), 05/16/05 are all Counterfeit Securities designed to perpetrate a constructive fraud upon Lynda Wall. It is clear from the actions of the above named federal government officials, employees, agents, and public officers that they have acted above and beyond their scope of authority by placing into the public record unsubstantiated claims against Lynda Wall which they knew or should have known to be false because said claims were required by law to convey subject matter jurisdiction for the particular regulated activity that is being alleged to have created a duty, obligation or right of action to the United States of America. The Declaration signed by Ms. Shereen Hawkins on 04/13/04, under penalty of perjury, is totally false and a constructive fraud since none of the information constitutes prima fade evidence unless the enforcement regulations that identify the particular type of activity being reported is also placed into evidence. There simply are no evidentiary facts here. Ms. Hawkins has lied and perpetrated a constructive fraud under oath as she has not identified any regulated activity concerning Lynda Wall; her Declaration is a counterfeit security. The Petition to Enforce Summons signed by Gregory E. Van Hoey on 07/14/04 and presumed to be under oath is also totally false and a constructive fraud. Mr. Van Hoey has made a very feeble attempt to justify his actions by placing into evidence 26 CFR 301.7602-1. This is a moot regulation because it also requires the evidence of the regulation for the particular type of tax (see 26 CFR §6001-1 and 301.6011-1). A check of the above listing of enforcement regulations will reveal that 26 USC §7402(b), 7602 and 7604(a) have nothing to do with Income Taxes, Employment Taxes or Lynda Wall under Title 26 USC and 26 CFR. Mr. Van Hoey’s Petition is a counterfeit security. The Order of Civil Contempt by alleged Judge Dean D. Pragerson and Gregory E. Van Hoey on 05/02/05 is a counterfeit security and constructive fraud. The alleged Judge knew or should have known that the Order to Show Cause was defective since Lynda Wall’s Proof of Service regarding the Verified Notice of Missing or Defective Order to Show Cause was served on 04/23/2005. See Item #31 of the Docket Report. Mr. Van Hoey, who prepared the Order of Civil Contempt, has lied and perpetrated a constructive fraud as he perjured himself by stating on pace 2 that Lynda Wall not file any response to the motion prior to the hearing. See Item #28 of the Docket Report which clearly shows Lynda Wall did timely file a Notice of Reliance Upon Alibi Justification on 04/12/05 to the Order to Show Cause. The Warrant for Arrest by alleged Judge Dean D. Pregerson, Sherri R. Carter, Clerk of Court; and John Chambers, Deputy Clerk on 05/16/05 is a counterfeit security and a constructive fraud since none of the information constitutes prima facie evidence unless the enforcement regulationsthat identify both the statutes and the regulations required by law to impose a duty or obligation upon Lynda Wall to appear by law to impose a duty or obligation upon Lynda Wall to appear before a United States district Court and produce books and records pursuant to regulations promulgated under 27 CFR Part 70, Alcohol, Tobacco, Firearms and Explosives,when there is no foundational evidence to support that Lynda Wall is engaged in a federally regulated activity, event or commodity pursuant to said statutes and regulations. The alleged Judge, the Clerk of Court and the Deputy Clerk knew or should have known that the Warrant for Arrest was void since it lacks the evidence of the specific Title violation and it lacks the evidence of the specific United States Code Section(s) violation. It would be impossible for Lynda Wall to prove she did not engage in some federally regulated activity, event or commodity when the Government and the above named Government officials, agents, employees, and public officers have not alleged or produced evidence that Lynda Wall has engaged in a federally regulated activity, event or commodity under the statutes and CFR Regulations of 27FR Part 70 associated with 26 USC §7401, 7602, 7603 and 7604. One can not prove a negative. It is the duty and obligation for the Government to produce evidence of a positive. Therefore, the Order to Show Cause (absent a court seal, not dated by and not signed by alleged Judge Dean D. Pregerson) is a counterfeit security and constructive fraud in that Lynda Wall can not be made to show Cause as to why she did not violate CFR regulations which either do not exist or do not apply to Lynda Wall pursuant to the evidence and instruments before the court in action CV 04-05352-DDP (MANx) in the Central District of California District Court, Western Division. The IRS Publication 5 states that the nonresident alien (dejure state Citizen) has no remedy before the United States District Court or the Tax Court. They must go to the U S. Court of Claims for the District of Columbia or the united States District Court of Appeals for the District of Columbia. Lynda Wall is not and has not intended to be a federal State citizen or Resident as set forth and defined in the Buck Act, Title 4 USC §105-110. Lynda Wall does not support the federal international bankruptcy declared legislatively by HJR-192, passed by Congress in 1933 and declared judicially by the United States Supreme Court in Erie Railway v. Tompkins 1939. Lynda Wall does not support the federal 51 shadow States that have taken over the de jure state functions since the 1930’s. Lynda Wall does not reside in, nor has been a citizen or resident of, the federal shadow State of California, Lynda Wall does not live in the federal territory of the Central District of California, a federal area created out of thin air by the Buck Act and other legislation that has usurped power and authority from de jure Government. Before any agent, official, employee or public officer of the United States or one of the federal 51 shadow States created to impersonate the 50 de jure states (See definitions in 31 CFR Part. 1, Sections 51.2 and 52.2) acts upon the declared status of Lynda Wall, Su Juris, as that of ‘”non-resident alien” to the Corporate Federal “United States”, such agent, official, employee or public officer is directed to take Judicial Notice of St.Louis Park Medical Center v. Lethert, 286 F. Sup. 271 and 28 USC §2201. All IRS agents and United States Courts are thus barred from making a “status determination” with regard to federal income taxes and federal income tax laws. Consequently, if IRS agents and Courts are barred from declaring Lynda Wall, Sui iuris, a “taxpayer”, this is prima fade evidence that the federal income tax is voluntary. Wherefore, both IRS agents and United States Courts lack jurisdiction and the declared status of the Accused must be accepted. Lynda Wall is not a “person” as defined in Title 26 USC §7343 as one upon whom the District Court has jurisdiction to bring an enforcement action and a summons pursuant to 26 §7402(a) and (b). 26 USC §7343 defines the term “Person” to include “an officer or employee of a corporation, or a member or employee of a partnership, who as such officer, employee, or member is under a duty to perform the act in respect of which the violation occurs”, The only mandatory duty and obligation under law is that promulgated pursuant to 27 FP Part 70. Lynda Wall has no nexus to that regulation shown in the counterfeit securities presented by the Government agents herein. DEMAND is hereby made on you, Alberta Gonzales, United States Attorney General, to investigate the above named government officials, employees, agents, and public officers for creating, using and promoting fraudulent and counterfeit securities in a fraudulent scheme in order to solicit Lynda Wall by duress and coercion into participating in a scheme to produce books and records from her in excess than those authorized by law in violation of Title 26 USC §7433 for damages caused by agents, officers, and employees acting recklessly and intentionally in excess of statutory provisions and regulatory provisions of Title 26 USC. Further DEMAND is made, pursuant to Title 26 USC §7401, for the production of the signed delegation of authority from the Secretary of the Treasury of the United States which authorizes or sanctions the proceedings against me by the above named government officials, employees, agents, and public officers. Please send me a copy of the signed delegation of authority from you, the Attorney General of the United States or your delegate directing the action against me to be commenced. The above demands are made pursuant to the statutes and regulations under Title26 USC and the other laws and statutes of the United States, including, but not limited to, the Uniform Commercial code, §3-501. Attorney General !! l am sure that if I were suspected of counterfeiting the securities of the United States, a full battle dressed SWAT team would invade my private dwelling, kidnap me into United States federal jurisdiction, arrest me, and prosecute me to the full extent of the law. I hereby DEMAND that you honor your oath of office to defend and support the Constitution for the de jure united States of America (if you still are loyal to that entity). In so doing, I DEMAND that you investigate the illegal acts of the above named United States officials, employees, agents, and public officers and cause to issue indictments and prosecute all suspected parties for the counterfeiting of the securities of the United States, pursuant to 18 USC 4 and 18 USC 513; and also to investigate, indict, and prosecute all violations by the above named United States officials, employees, agents, and public officers for violation of 26 USC statutes concerning their attempts to coerce me into producing books and records under threat of incarceration, but not allowed by statute and regulation. In the alternative, if you are unwilling or unable to investigate, indict, or prosecute the above named individuals, identify the lawful reasons why and relate said reasons to me in writing within 20 days from receipt of this letter. When you need longer than 20 days to respond, send me a written request for an extension of time within the 20 days and it will be given to you. Failure to respond to this request timely and upon the merits of this demand and inquiry will be prima facie evidence that the United States Government and its agents, employees and officials are engaged in an ongoing constructive fraud against me to deprive me of my unalienable rights from God. I, Lynda Wall, declare under penalties of perjury under the laws of these united States of America that the foregoing is true and correct to the best of my knowledge, is made in good faith and is admitted when not rebutted. So we've been waiting to see how the new "Bail-In" plan will roll out in the USA ever since we saw it happen in Cypress. Now we've got our answer! "U.S. Bankruptcy Judge Steven Rhodes ruled today that Detroit is eligible to file for Chapter 9 bankruptcy protection. That ruling clears the way for the city, the largest ever to declare bankruptcy, to restructure its $18 billion in debt. And, in a move that's sure to be closely watched by other struggling municipal governments, Rhodes ruled that the city's public-sector pensions could be reduced as part of that restructuring. Rhodes said in a summary of his ruling that Michigan's state constitutional protections for pensions "do not apply to the federal bankruptcy court." This: In the "Bankruptcy Reform Act of 2005" the banksters got the US Congress to pass a law classifying repos and derivatives as secured assets with "super-priority" in bankruptcy. Pensions are classified as unsecured assets so the pensioners are paid AFTER the banksters. Basically, the current assets in the Pension Accounts will be used to payoff the Banksters derivative cons. That my friends...is the new Bail-In! Will the People of Detroit take this lying down? I doubt it. They will not accept losing everything they worked for their whole lives to these thieving robber barons. They will take to the streets with "modern day torches & pitchforks"...as we all should. Lock your doors Banksters...Let the Revolution Begin! 4. Bankers rejected: Hungary recently became the first country to follow Iceland’s lead by shedding international bankers (IMF) and is considering pursuing prosecution of past prime ministers who enslaved the people with debt. Look for this trend to continue even if nations decide to default to break free. 7. Militarized police state: One of the darkest signs that the elite are losing their grip on power is the construction of the militarized police state specifically trained to combat domestic civil unrest. Local cops with tanks and other combat gear are working with Feds at Fusion centers, active Army units are on American soil for the first time in history, the NSA spy grid is being used by the IRS and DEA, and the elimination of due process for Americans under the NDAA are just some of the tyrannical moves made to secure the elite criminals from public backlash. They’re clearly scared, and they should be, given what they’ve done to the American people and the Constitution. 9. GMO food being rejected everywhere: Control the food and you control the people. True in theory, but much more difficult in practice. GMO leaders like Monsanto are being exposed. All of their economic and political strength cannot defeat the spread of knowledge about the dangers of pesticide-soaked Frankenfoods. GMO fields are being burned in protest in America and around the world, informed nations continue to reject their products, and labeling laws are gaining traction. 17 IRS OBJECTING,WANT EXCLUSION OF OBAMACARE! IRS OBJECTING,WANT EXCLUSION OF OBAMACARE! "When you and the President sought our support for the Affordable Care Act (ACA), you pledged that if we liked the health plans we have now, we could keep them. Sadly, that promise is under threat. Right now, unless you and the Obama Administration enact an equitable fix, the ACA will shatter not only our hard-earned health benefits, but destroy the foundation of the 40 hour work week that is the backbone of the American middle class. (full text of letter sent to Pelosi and Reid)"
Yes, they are just now realizing that the “new normal” mandated by ObamaCare is a 30-hour work week, something that many of us warned would have massive economic and cultural repercussions, many of which would hurt the middle and lower-middle classes. It’s not rocket science, but for some reason, these unions are only now thinking it through. Ditto the fact that Obama was disingenuous, knowingly so, when he repeatedly told Americans that if we liked our insurance, we could keep our insurance. Even a cursory reading of only the first four-hundred or so pages of the ACA (all that I managed to wade though) proved that to be false. Frankly, common sense said that had to be a lie, just as common sense revealed the ridiculous fabrication that was Obama’s claim that ObamaCare would not raise the federal deficit by even “one dime”–a claim he later acknowledged was patently false. On the one hand, I’m not unhappy that these unions are finally figuring out what we’ve been saying all along: ObamaCare will do far more harm than good, not only to our country’s health care system and economy but to the majority of Americans who are currently covered by either private or public plans. It never really made sense to destroy a system that was satisfactory to the majority (253.4 million) to accommodate a mere fraction of that (10-30 million, depending on sources); well, it made sense if the goal was ultimately a national health service, but that’s another story. "We have been strong supporters of the notion that all Americans should have access to quality, affordable health care. We have also been strong supporters of you. In campaign after campaign we have put boots on the ground, gone door-to-door to get out the vote, run phone banks and raised money to secure this vision." They pushed it, they can live with the results just like the rest of us. Congress should not be permitted to exempt itself and its staff on the same grounds: you think it’s great for everyone, then you need to enjoy the fabulousness along with the rest of us. The latest union to resist ObamaCare is even more ironic. And outrageous. Not only will the IRS, in whom and with good reason Americans now have very little trust and for whom many of us have even less respect, be the primary enforcers, but they will also have access to still more personal information, personal information with which they’ve demonstrated they cannot be trusted. I find it particularly abhorrent that the same group who will be enforcing the ObamaCare Tax on the rest of us think they, themselves, should be exempted. There is no more safety in the violation of the Second Amendment in the state of California. If they have an excuse, you loose your rights as an American Citizen. 19 How Can We Change the World? Dear and beloved beings of the light upon the Earth. Much love and respect is sent forth through my being to you from the loving souls of the universe of the Creator, your soul friends and family. You are so tremendously supported in your current lifetimes and we wish for you to know that we are guiding you to continue to step into your divine unfolding purpose upon the Earth. You may not understanding your purpose but we will say to you with the deepest of love you are walking and existing as your divine purpose now, in this very moment. Acceptance that you now exist as your purpose and that your purpose is your existence will allow a great wealth of insights to be accessed from your soul. Often through content rather than striving we are able to access the deepest knowledge of the soul. Please allow yourself to open up completely to receive the love flowing from your family with the universe of the Creator, we wish to recharge, refuel and inspire you with the brightest of light and quick vibrations so that you may exist in remembrance of the Creator upon the Earth. 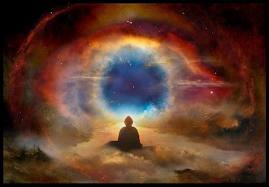 In a time upon the Earth where confusion is prominent I wish to bring forth some clarity and insights from the Creator. You are aware that you have moved through a major shift on the Earth and within all your energetic bodies since 2012, this is something you are adjusting to with every moment of your reality. Small adjustments allow for larger shifts in consciousness and energetic vibration to occur with relative ease. Even as these shifts take place within your being bringing forth access to greater expansion and realisation of higher levels of awareness you may look beyond yourself wondering when signs of change will blossom within your reality. It is my wish to speak with you offering some enlightenment concerning how we can change the world. You will notice that I choose to suggest that we as a united collective, speaking of all upon the Earth and the inner planes, can alter the reality of the Earth. You alone cannot alter the world it is something to be achieved as a unity and in oneness with all that is the Creator. The vibrations of love from the universe of the Creator are flowing through my being to you, we wish for you to know that you are connected and united as one with us, therefore through you and as a united group we can assist and support many transitions upon the Earth. It is valuable when many of you upon the Earth with like minds gather together with an intention of making a difference upon the Earth but we understanding for many reasons this cannot always be possible, please know that you can play a divine role in bringing change to the Earth and we are here to support you, acting as a group in oneness with you to bring forth powerful awakening from the Creator into the consciousness of many and the Earth. The first perspective is to observe all that is occurring upon the Earth and to contemplate whether change is necessary. With this practice you are actually contemplating your belief in the Creator. Many of you will state that you are not happy with the ways of your world and the great world around you. You may see suffering, pain, judgment, limitations and negativity in the world and wonder how the world can alter into a more loving space. When another person is experiencing harm or suffering, it can be difficult to even recognise that the vibration of the Creator exists upon the Earth. The first perspective to adopt and to recognise within your being is that everything around and within you is already the Creator. The divine will of the Creator is unfolding and interweaving through every circumstance and reality of the world. It can take tre mendous trust to accept this statement but when you recognise that the Creator is within every soul upon the Earth, while understanding that there is a reason for everything experienced upon the Earth you begin to see beyond pain and suffering, acknowledging the presence of the Creator even in the most chaotic of experience. With this perspective you begin to notice the harmony that is present within chaos, the healing and returning to the Creator which can be found in painful situations as well as the self-mastery found in challenges whether you experience or observe them. There is a reason for everything occurring around you, by holding faith that the Creator is present eternally within all aspects of reality encourages you to feel content, you will no longer feel your emotions or thoughts reacting negatively, judgmentally or fearfully instead you recognise the truth of the Creator. Already you are detaching from the drama of life realising that peace is present in any sit uation. Thus everything is so much easier to deal with and work through, an inner strength begins to build, which constantly draws you back to love and peace. With this perspective you are able to support alterations in the world because you are being accepting of the world and its people, learning to love the world rather than to judge and energise negativity through your attachment to drama. The second perceptive occurs almost automatically because you begin to notice the wonder, beauty, kindness and bliss of the world. You have withdrawn from drama and reacting to the outside world, thus a contentment and love swells from within encouraging you to see the wonders of the world. You are attracting into your reality and attention from the outside world the same that is forming within your being. This can only build becoming more magnificent until you recognise miracles and synchronicities within your reality. It is at these times that you know you are building a realisation of the Creator within your being which is being projected into your reality. Although this benefits your reality and allows experiences of joy and love you may wonder how it can support the world. Holding a perceptive of love and projecting it into your reality e specially by being grateful, content and seeking the beauty of the Creator within your reality will allow for many negative attitudes and projections you created to dissipate, your outlook will become positively infectious at one level and the lightness and expanse of your energy will support and inspire others often without your awareness. Your energy and your connection with us upon the inner planes will flow with tremendous freedom into the world acting as a catalyst of awakening. Thus your vibration and the way you interact with the world will be a facilitator for change. You may notice alterations and shifts within your own being and those around you but often it is situations and circumstances that are distance to you that encourage a feeling of disappointment in the world. With the two previous perspectives you may find yourself feeling stronger, empowered, compassionate, loving and understanding. Often many chaotic or negative situations within the world are energies from the past moving through to be released, some releases can cause a manifestation which allows many to recognise the release, encouraging supportive healing vibrations to be sent and anchored to aid completion of the cycle of the energy. You may believe it to be sad that many suffer simply for an energy to be released but people involved may be tied to the energy or had even created it in another lifetime and so are also completing a cycle t hat will create freedom and understanding. Again we are returning to the first perspective where there is a need to understand that there is a divine purpose for everything, the use of acceptance allows you to adopt this understanding. The third perspective is to recognise that it is your purpose along with others to invite the Creator to be in action within your reality and the circumstances of the world. The Creator is always present but sometimes we have to ask for the Creator to be in action which symbolises that we open ourselves up to act as an instrument for the Creator light, divine healing and influences to create harmony and enlightenment. We are inviting the Creator to anchor more fully and consciously within each person and situation while asking that we may be of service by allowing the Creator to act through our actions, thoughts, emotions and consciousness to bring forth healing, shifts and the greater light of the Creator. Remember that you are not offering yourself as an example of the Creator but are allowing the Creator to work through you, in order for this to occur there is a need to be aware of and follow your divine intuition. There are many ways in which you can bring healing to the Earth, help create the Era of Love upon the Earth or even alter the world you exist within but if we were to share practices they wouldn’t be as powerful as holding the intention and asking for the Creator to be in action in order to bring forth healing, love, enlightenment, bliss and harmony. Remember that every time you focus upon the light and bring the Creator through your being in whichever way you choose you are supporting a rise in consciousness and vibration within the Earth’s frequency and all that are present. Do you remember dear ones of the days long before there were cellular phones and high tech devices to distract your ability to hear the gentle lull of nature? Long before the explosion of technical advancement there existed a time where divine silence covered the earth from one corner to the other – where peace and quiet wasn’t difficult to find. Now with all the hustle and bustle of advancement, finding that blanket of peace becomes an ever-increasing challenge. When peace is finally found, what is often met as well is the feeling of all your wishes and prayers that concern the future of not just of your own life but for the life of every person that share your earth will come true. Coming to this place of deep and respected silence there is so much Inner Growth going on. Its important dear ones to tune in to this silence – into the peace that is coming from within, and to communicate with your whole self through subtle energy. You already know dear ones how connected you are with God, through the precious heart that beats in your chest and with the living and breathing Earth that thrives beneath your feet. Changes will always come to you; it is up to you to make the most of every opportunity for the greatest of good for all. Even within all the noise your advanced era has brought, it is just as important now as it was before all the advancement to find a place where you can focus your attention to God, to your Earth Mother and to the world of spirit; while discovering ways that are effective to your ability to relate to others regardless if they are your neighbour or someone who lives across the world. What a challenge your new and exciting world poses when you are trying to make a divine and sacred connection to God. It’s enough to learn how to quiet the mind, but even more of a challenge to drown out the noise of the outside world with your silence, but nothing is impossible dear ones when you want to accomplish something bad enough that is important to you. The incessant chatter of what each person is doing has replaced the cheerful gurgle of a stream or to the whistling leaves of a Willow Tree. Now what is more often listened to is the noise of a busy office, a loud filled classroom of excited children, gossip, or video games that distract a wide range of ages from the serenity of nature and of the calm that she comes with. One of the things we have witnessed dear ones, with the advancement of all your technical devices there has been an increased fear for those of the modern era of being alone because they have become accustomed of knowing everything about everyone at the push of a button. For the many dear souls that are just entering this advanced era of information and technology they have a much more difficult time communicating with their Inner Self and with God. It requires greater discipline now to turn off the phones, the games and other high tech gadgets and to push away outside distraction to give your pure and give your full focus and attention to your spiritual and personal growth and development. Silence is essential dear ones. Through the comfort of silence you are able to enhance your own individual consciousness and awareness in order to re-nourish your whole self from the Source of your divine creation. Know dear ones, God is the Source of the nourishment for your whole self to revive and replenish the peace and calm from within so you may share this rebalanced and loving nature of your being with others. Understand dear ones, without silence; it becomes difficult to hear what God is saying, to His Divine Guidance and Direction because there are too many distractions demanding your attention. Choosing to ignore silence seems to have become an epidemic for some dear souls as they are enraptured by the explosion of information and technology and they become prideful for becoming so busy to take the time to smell the roses or to sit under a tree in silence just because. Silence is essential dear ones for your Inner Accomplishments to thrive that cannot be met from outside influences or distractions. You cannot build your Inner Self without silence. Understand the depth of your soul and what is brought forth from the silent moments you enter brings you closer to understanding the purpose of your life and this silence for however long you enter it’s comforting realm pulls you away from the clinging clutches of the distractions of the outer world, where you can rest in the peace and calm your heart and soul has been yearning for. We know you can’t always be in silence, we understand many of you work, go to school or you are at home running a business or looking after children. Yet with discipline, you can easily add a time in your busy week for silence. Make room at least once a week for yourself to flow through the comforting and peaceful energy that silence brings which allows your soul to exhale through the comfort your heart is also experiencing during this quiet moment with your Inner Self. As you allow yourself a weekly quiet time with your whole self, you are giving yourself a great gift of healing, liberation and renewed exuberance for life and to the challenges you have just taken a break from. Think of silence as the language of your soul. Through the silent moments you give yourself, you are allowing your Self to be guided through God’s Loving energy to new directions in your outside activities where they may be enhanced through new creative ways and methods. Coming home to your silence will deepen the meaning and purpose of your life dear ones. Without silence dear ones, it is not possible to evolve into higher states of consciousness and awareness. The development of your journey both personal and spiritual requires you to become more aware of your own selves as a contributing member of society as a whole. Through silence dear ones you learn who you really truly are, what is authentic and real, and you learn to let go what you imagined yourself to be. Instilling a special time of silence into the universe of your life is crucial to the healthy growth and development of your whole self, just like food is required for your body, silence is needed for your soul. You soon come to realize the importance of having a healthy personal life is just as important to having a healthy spiritual life as you recognize your connection with God and with all the Divine gifts He has bestowed upon you as a way to express His love through your actions, words, thoughts, feelings and will. Life will continue to be lived in frivolously until each dear soul learns to consider themselves worthy enough to have the sanctuary of peace that found within the element of silence that will permeate every corner of their lives. Know dear ones the more often you frequent the precious and sacred silence of your Inner Self, the closer you are with God and His Mighty Presence. Remember silence is the path for the growth of your spiritual journey that will bring positive changes to your personal life. Your quiet time in silence can be found through deep contemplation, meditation, simply sitting in a quiet spot, or watching the sky turn from day to night, the places and ways of where silence can be found is endless, what it’s important dear ones is that you discover which method of silence is best for you to reconnect with your Inner Self and with Source of Light energy of your Being. You are restoring your balance, peace and calm to your whole being every time you choose to be silent and listen to what is found only from within. Remember dear ones to restore the balance, peace and how life is meant for you to live will always be found through the time you put aside to be in silence. "My dear ones, it is time for the continuation of the messages through you from me, SaLuSa, and any others who may feel the time is right. We are all in sync with you and we ask that you not only bring messages through as you feel, but that you know that we are with you 100% in this and all that you do. It is most challenging for some to believe in themselves in this time of ascension. I assure you both, in fact, that it is time for you both to bring information through that is pertinent to the times. Welcome back, and tally ho!"
. So I will proceed to send out one from SaLuSa every other week on a Friday. These will of course only go out to people on my current subscribers list. For anyone wishing to add names to it, I detail below how to do so. If all progresses well I will certainly send out messages on a weekly basis in due course. So we ask you to stay within the Light at all times, and do not be distracted by anything that is clearly not of it. For a very long time the truth of your being has been held back from you, but very soon it will be known. It will speed up your progress and without the interference of the dark Ones it will soon reach higher levels than at any time since this cycle commenced. At the end of a cycle there is much sorting out and each soul is given every opportunity to move into their highest level of being. Since in reality there is no such thing as time, everything is in the now and there is no need to worry about another souls progress. Each soul has an infinite amount of "time" in which to complete their journey home. All happens in perfect relationship to all else in accordance with God's plan for Man. Be assured many souls travel with you on your journeys and you are never alone. They are your helpers and guides to give you every assistance and enable you to successfully reach your goals. You will find that it is always the more evolved Beings that reach down to help those following in their footsteps. However, they do not impose themselves upon you, but will always respond to your calls for help. It is necessary to bear in mind that you do not always get what you call for, as your life plan is known to them and in accordance with it the most appropriate action is taken. They will gently and wisely point you in the right direction and celebrate with you when you have achieved your life's plan. Please note that to unsubscribe/subscribe to my weekly postings, you should go to: www.treeofthegoldenlight.com/new_subscribe.html - .Use the registration at the bottom where you will find "Membership to the Mailing List@et.treeofthegoldenlight.com" enter your details twice as requested and click on either "Please remove me from your list"/"Please subscribe me to your list" If you were successful you will see it acknowledged on the screen. OB care once again BAD NEWS! THIS NIGHTMARE. MANY OF THEM ARE NOW OVER 76 BUT THEY DON’T CARE BECAUSE THEY HAVE THEIR OWN PRIVATE INSURANCE. Judge Kithil has written. Obama doesn't need death panels because when you reach 76 just say "Sayonaro"! few of the things that we Seniors are going to have to deal with starting in 2014. Obama Care. Just wait to see what happen in this year and 2014! Remember she said, "We have to pass the Bill so that we can see what's in it." Well, here it is. Association of Community Organizations for Reform Now - ACORN). ** Page 241 and 253: Doctors will all be paid the same, regardless of specialty, and the government will set all doctors' fees. This is what they do in Sweden too. ""Finally, it is specifically stated that this bill will not apply to members of Congress. Wonderful News! Mike Quinsey will be Resuming his Channeled Messages. Welcome Back Mike! I Am St Germain, and I Am here today to let you know of your advancement in your preparations for ascension. You are supporting all of us in your co-operation with the changes that are upon you. You have overcome so many obstacles and are rising above so much of the negative energy as it rises out of the environment that has been supporting it for so long. When the light expands within Gaia it pushes out the old darkness and gives it its freedom to express the old, and to make way for the new. As this expression involves itself with the life on the surface it carries with it many tripping energies that are designed to give you all difficulties that you can choose to recognize as old stuff and let it go on beyond your present day. In doing this you are giving freedom to the old way of being and allowing the new way to spring forth in expression from you and from all of life on and within earth. This is the power you have. This is the result of the efforts you have engaged in with your inner knowing guiding you in every step. You wonder, with these words, why it hasn’t been a time to ignore the old negativity. It is a matter of seeing it for what it is, then thanking it for what it brought you, and then releasing it to be transformed into the bright new beingness that it is destined for. Yes, all of life and all of the energy that is ingrained within all of existence is destined for the return to the completeness of Love. It is a matter of seeing it as it flows forth, and allowing it to find and claim the freedom that it cherishes. It has been quite a journey, wouldn’t you say? It is coming to a head in so many instances of earth life, and it is so in love with the journey, for it is so close to being at the atoll of release into the free and loving peaceful joy that is at the doorstep to forever. What do I do, you wonder at times, when it seems that there is so much turmoil? I tell you this, there is so much you have already done for the enlargement of the universe. You have added to the beauty and the wonder that is employed in your everyday life. Now you are seeing the results as you awaken each day to the brightness and the distinctly more enriching circumstances in your life. As you step forth out your door and look at the sky, seeing our ships cloaked in clouds you see what you have assisted in being with you. As you gaze at the night sky and see the colors and beams of light radiating forth from our ships you see the wondrous beauty that you have been a part of creating. As you walk in the deserts and forests, beside the rivers and up the mountains and you see the clarity that has not been there before, you see the evidence of your part in our being able to walk with you in the cleansing of all of the earth and the inner love of Gaia. So, my dear family, go on in your journey through the love and trust that you have set in place and know that as we continue to work with you it is all falling into place for the ascension to be upon us all at the pace that is being designed in every moment. We are so grateful for your part in all of this, for you have toiled long and arduously through this whole duality experience. Now we are beyond the boundaries that were set in place. It is a matter of seeing this in so many ways that are surrounding you now. We are ready for the jubilation that is just around the corner and down the glen, to the place of eternal celebration of all of existence. Bring it on in laughter, glee and eternal joy in Love. Treasury Secretary Jacob J. Lew will assert on Thursday that the Obama administration's vast overhaul of the financial system is close to accomplishing its goal of shielding society from the dangers posed by giant banks. In a broad policy speech intended to signal the administration's views on financial regulations, Mr. Lew will also make it clear that more measures may be needed to strengthen the global system. In comments that will most likely upset foreign governments, he will call on overseas regulators to make their rules tougher. "We will press other jurisdictions to match our robust standards — including in Europe and across Asia," Mr. Lew will say, according to a draft of the speech, which he is scheduled to give at the Pew Charitable Trusts office in Washington. More than three years after the overhaul began, Mr. Lew says that the largest banks are safer today, making it much less likely that taxpayers would have to bail them out in a future crisis. In an exclusive interview, U.S. Treasury Secretary Jack Lew discusses the pace of U.S. growth and the impact of the debt ceiling debacle. "Earlier this year, I said if we could not with a straight face say we ended 'too big to fail,' we would have to look at other options," he says. "Based on the totality of reforms we are putting in place, I believe we will meet that test, but to be clear, there is no precise point at which you can prove with certainty that we have done enough." Mr. Lew's comments come as regulators are scheduled to meet next week to finally approve the Volcker Rule, a cornerstone of the overhaul that tries to stop banks from speculatively trading with depositors' money and other funds. In recent months, the Treasury Department has pressed the five agencies that worked on the rule to finish it before the end of the year. The Treasury secretary's comments are likely to add more fuel to the debate over the adequacy of the rules that stem from the Dodd-Frank Act, which Congress passed in 2010. Critics of the legislation say it does not solve the too-big-to-fail problem, because, they say, it does not directly limit or reduce the size of the nation's largest lenders. To make up for this perceived shortcoming, some Republican and Democratic senators this year introduced two pieces of legislation that they said would be much more likely to constrain the biggest banks. Against this background, Mr. Lew's speech gives firm backing to the policies that stem from Dodd-Frank, but it also says officials have to remain vigilant to make sure that the rules work effectively. Additional actions may also be necessary, he says. "If, in the future, we need to take further action, we will not hesitate," he says in the draft of the speech. Mr. Lew is pushing for new measures to reduce the risks posed by money-market mutual funds. In addition, he argues that vulnerabilities still exist in the short-term debt markets that Wall Street firms tap heavily. TheFederal Reserve is expected to propose new measures soon to make these short-term markets more stable. The speech also calls on Congress to provide all regulatory agencies with enough money to enforce the new rules. Much of the speech, however, was devoted to the progress of financial regulations overseas. Next year, the Treasury expects to focus on working with foreign regulators to devise plans for winding down a large global bank in an orderly way if it gets into trouble. "The failure to work out such arrangements now could pose a significant future risk to our financial system," Mr. Lew's speech will say. The Treasury Department also remains concerned about regulatory loopholes in overseas derivatives markets. Federal regulators, seeking to rein in risky derivatives trading at big banks overseas, have landed in a turf battle with foreign finance ministers who are vying to limit the reach of American authorities. A deal was struck in July for a joint approach to cross-border trades. 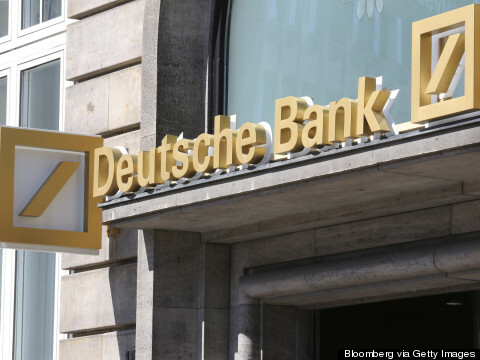 But on Wednesday, in a move that underscored the continuing challenge of carrying out Dodd-Frank, Wall Street trade groups filed a lawsuit that challenged cross-border guidelines that American regulators had put in place. Mr. Lew's comments also suggested that the Treasury believes that foreign governments may use trade negotiations as a way to weaken financial regulations. "We will not allow these agreements to serve as an opportunity to water down domestic financial regulatory standards," he says. In reality, much still needs to be done in the United States. Although theVolcker Rule may be soon be finished, several complex and far-reaching requirements that arose from Dodd-Frank still have not been completed. These include crucial rules on derivatives and mortgage lending. Mr. Lew said very little about efforts to overhaul housing finance in the United States. The taxpayer still backstops nearly every new mortgage, and the Obama administration has taken few steps to move home loans back into the private sector. "Significant housing finance reform is still needed to add clarity to the market and attract more private capital," Mr. Lew says. Beautiful Hearts, there are so many wonderful treasures all around you; your talents, gifts, and your whole self that over time and with enough sufficient application of the Right use of lovely actions is able to clearly bring you into the realm of the Mother that is within each of you. With all the gifts and skills you already have acquired take a look and determine in truth and honesty where there is need to fine-tune those gifts and skills. As you learn to hone and master those skills and gifts that are your treasures, the divine light of the Mother that has always been just below the surface of all that you are becomes unveiled. When this divine and sacred moment arises, you will come to feel and know the great abundance of Love being bestowed upon each of you from God, providing you with His Light, His absolute Truth and all the sacred and profound God Qualities that your heart and soul has been reaching for. Dearest Beautiful Hearts, we know how long you have waited and wanted to have the door to your past and even your future to be heaved from your own precious consciousness. We know and understand how disconcerting it can be to see any part of your future expanded before you, giving you an indication of possible possibilities that the years ahead may bring, while at the same time maintaining a harmonizing balance and peace of mind that will provide you comfort during the life you are currently living. Accept Beautiful Hearts, the wisdom of your own presence, discover happiness in unsuspecting places and enjoy its gift of joy that it brings you. I am here before you extending my hand to you in love, will you accept my love from my own heart and as me as your own mother? I am here before you, sharing with you the comfort of my own hands in order for you to share this comfort with others with the love and compassion that is found within your own precious hearts. As you move forward Beautiful Hearts, tackling all your endeavors you are always increasing your understanding of God’s Love and His Divine Light being an important part of your own being. As you continue to take each step towards His breathtaking Light, His Love and Divine Qualities become part of your own inherent nature. You find yourself becoming One with His Heart and as you accept my love you also become One with my own and through your actions that you express thereafter they will be received and felt with love and sincerity. Embrace this Oneness Beautiful Hearts and share the beautiful vibrations that you will feel from our sacred connectedness and allow our energy to work though you, sharing the love-filled energy that becomes a blessing wherever you travel. Beautiful Hearts, we know you wait in pure faithfulness while you move in and out of experiences and certain challenges. You learn to tolerate disappointments from any wish your own heart has yearned for through the energy of Light that God openly shares with you. Know Beautiful Hearts, His Light will always be the anchor along your journey. His Light is always constant and it never becomes extinguished. As you persevere each challenge and each experience you know you are becoming stronger and the wisdom gained will benefit you with knowledge for future need and use. Understand and know Beautiful Hearts any delay that has caused disappointment is not meant to remain forever, only temporary. We love you, I love you and I am always here for you with my extended arms, opened to embrace you with all my Might and Love. We know there are going to be difficult challenges and you know this too, you just don’t always know when they will suddenly appear, but remember God’s Light is Brilliant and His Light will penetrate all darkness, providing you a way out of any difficult trial or tribulation. Hone in on His Light, allow His Infinite Light be the beacon you need and follow it home with trust and faith in the purity of His Love for you. There is a lot of commotion lately as many of you are transitioning as well as Mother Earth is moving through her own necessary changes. All the changes that have been felt and are still being felt have been intended long before this life-time. They are not necessarily new but they are felt as new to those that were unaware of their awakening being a trigger to releasing some of the delayed manifestations. Your future cannot be rushed and all the information that is given by God to each of you comes when you indicate readiness. All comes to each of you when it’s meant to be. Enjoy your journey, inhale the love that God shares with each of you and exhale in His Light. For the many dear souls that wait patiently and in pure faith in God and in His Divine Will understand completely they are not just passing the time away in idle. While they are waiting, they are also contributing significantly and effectively to the community and to their global backyard by working as an anchor of Light for others with only the purest of intentions to send and receive Love, Light and Compassion that automatically reflects God’s own love unto all that crosses their path. The energy provided by your Trust and Faith is very powerful Beautiful Hearts and it is not meant to be underestimated as they both contain potent energy to create change. For all the dear souls that have experienced disappointment due to delays and have had to wait, we send you a torrent of love and gratitude. Your perseverance, we know was a great difficulty when faced with certain upsets and obstacles. The devotion each of you has given to your life and of your ability to open yourselves to feel the fullness of God’s Love and to serve as a sharer of Light is a true treasure in itself. Each of you has a purpose and we see each of you as a treasure. Please Beautiful Hearts accept my thanks and receive my blessings not just for today but for each day you rise to greet the day. Comprehend dear ones if it wasn’t for your own devotion and faith along your journey and through difficult situations, you would find it shaky to greet mankind with your love and compassion. But each of you are strong, you are all courageous and loving and through the Inner Activity joined with the Mother that is within you, you find the door that calls to your heart and soul to open and you do go beyond this door as you come to realize this door is not frightening, it is the threshold to God’s own Heart, forever joined with yours. Each dear soul that moves and breathes on your bountiful planet is Hope Incarnate. The Divine Purpose each of you holds is a promise of God’s Will and of His Loving Intentions to bring marvelous changes into this life-time through the power and energy of the Divine Realm, pouring His Love and Light into every person of every creed and race. May God, your Father and the Son, my Son fill your whole self with their holy blessings, where they keep you in comfort, guidance and love, while sustaining you within their Light. May you also accept the extension of myself when I share my love from my own heart with you during the times you require the soothing embrace and nearness of a Mother’s warmth and comfort. We know you have endured and you will always have a place within our arms, call to me, call to us and we will come, welcoming you home. The pouring of my love, nor the pouring of my Son’s Love or God’s Love will never cease. Your journey is not a lonely one, remember you have us; you have me and by working together for the greater good, you will become a blazing star of Divine Light filled to the brim of Love for all people, not forgetting to love yourself as well. Now it is our turn... only we do not need to re-write the Constitution...just kick out the corrupt bankers, politicians, and that ilk.